About 4 years ago, I made the transition from working full-time outside of the home to working full-time from home. During those first few months working from home, one of the most difficult things for me to grasp was setting my own self-imposed deadlines. I was used to the school and business world where there were always plenty of professors, coaches, and bosses telling me (and constantly reminding me) what I had to do and when I had to do it. I always had deadlines (and I loved deadlines) — but for the most part, those deadlines were set for me by someone else. I knew there would be consequences if I didn’t meet those deadlines… so I met them! However, once I was my own boss I had to work really REALLY hard to stay motivated, push forward, and continue setting goals and deadlines for myself. It’s not that I was irresponsible or lazy; not at all. I just wasn’t in the habit of setting my own deadlines — and it was much easier to say “I’ll do it later” or “I’ll do it when I have more time” (and we all know there is no such thing as “when I have more time”). Those projects just kept getting put off and put off. It was definitely a bit of a learning curve, but after some time, I began to get the hang of self-imposed deadlines… and the rest is history! Nowadays, I set deadlines for almost everything (even small household projects) because I know how much more productive I am when I have a deadline looming in the near future. In my personal experience, self-imposed deadlines are one of the key reasons I’m able to do everything I do and still have time left over for fun. Plus, as you’ll read below, self-imposed deadlines eliminate SO much stress from my life! Last year, I shared how I organize my weekly blog posts, and while I don’t always write all my blog posts on Friday, I DO almost always finish my blog posts for the week ahead by the previous Saturday night. This might mean that I do a little writing each night after Nora is sleeping, or it might mean that I spend a big chunk of my Saturday writing posts — either way, they are finished by Saturday night and I don’t have to worry or stress about quickly finishing my posts late the night before. I write a variety of posts for different blogs, websites, and print publications each month. And since I don’t have the time to write them all in one week, I give myself deadlines to finish one or two guest posts each week. The posts might not actually be due for several weeks, but by setting self-imposed deadlines I’m able to finish all these extra posts without feeling stressed or staying up all night. Plus, I usually have extra time left over to proof read them a few days later (with fresh eyes). Most of the tasks I do for my Virtual Assistant clients do not need to be completed on a specific day; however, they DO need to be finished by the end of the week. So to make sure I don’t have a ton of work waiting for me on Saturday night, I do certain tasks every Tuesday, other tasks on Wednesday, etc. etc. By using self-imposed deadlines, I’m able to space out the work and have a better routine to my days and weeks. 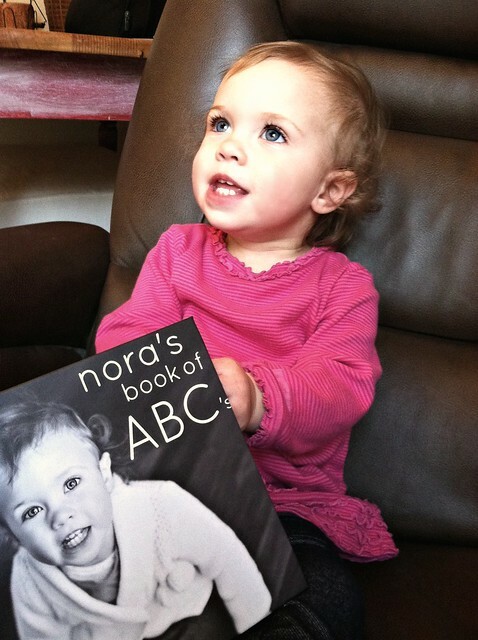 A few weeks ago, I shared Nora’s personalized alphabet book — and I mentioned that I gave myself the self-imposed deadline of March 31. If I didn’t make the time to finish the book before that date, then I would remove it from my to-do list and wait until summer (or whenever) to take on the project. 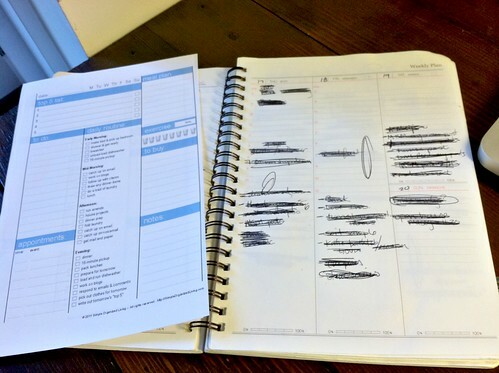 Even with smaller tasks like meal-planning and grocery shopping, self-imposed deadlines help me get more done. I always give myself the “deadline” of Sunday night to finish my meal planning and make my grocery list. Then I plan to get groceries on Monday when the store shelves are still stocked. I’ve already mentioned that I don’t have a specific cleaning routine, but I DO have general tasks that I try to do each day, each week and each month — just so I don’t get too far behind on things. Yes, there are days when I REALLY don’t feel like doing a load of laundry or cleaning the bathroom, but I try to remind myself that it will only take a few minutes and then I’m done… and I don’t have to think about it again for a while. None of these systems are perfect, and of course, there are times when I don’t follow through on my good intentions (shhh… don’t tell!). But for the most part, my self-imposed deadlines really help me to stay organized and simplify my busy schedule. Some of you might be thinking that self-imposed deadlines sound like a lot of work or like I’m working all the time. However, it’s exactly the opposite. Yes, it took a bit of time to figure out the right “system” but by setting self-imposed deadlines, I actually work faster, work less, and have MORE time to do fun stuff! What self-imposed deadlines do you use to stay motivated and on-task? My Weekly Routine - And How I "Do it All"
I used to give myself daily deadlines, but it actually stressed me out more than helped. Now I have weekly ones, and I find it so much easier to tackle each project knowing I have a full week to finish it. I just pick a few from the list each day according to my motivation and inspiration. I’m the same way. Setting deadlines for myself really keeps me on track. I have a small notebook that I have with me all the time and I write my to-do lists, my menu plans, and also write down all the most important things that need to be done. I agree that having self-imposing deadlines really simplifies my life. I’m a PhD student, so for a while now I’ve been used to working with self-imposed deadlines because that’s mainly how my work is structured. I notice one benefit of imposing deadlines on myself, besides simply providing the impetus to get more done, is that having a time limit forces me to be realistic about my tasks, instead of perfectionistic. This is true in my PhD work but equally true with other projects around the house. If my time is limited by a deadline, I’m more likely to assess what I can do in that time and be satisfied with that, instead of dragging a task out forever from a desire to do it unnecessarily perfectly. So many times, as a deadline approaches, I think, ‘I can’t get this done in time!’ because I usually have an exalted standard for what ‘finished’ means. However, if I take stock of what’s really necessary to get the project to an acceptable standard, instead of perfect, in fact I can finish it in time. I’m a natural perfectionist, so deadlines are really helpful for me because they force me to think this way about finishing a project. It doesn’t have to be perfect, it just has to be good enough and be done! Amen Jennifer — thanks for sharing your thoughts! I totally agree that by setting a deadline, it’s easier to be satisfied with “good enough” instead of working and working towards perfection. It’s impressive that you not only realize and admit you’re a perfectionist, but you also found a way to compensate. Kuddos! it’s not really deadlines, but I set aside 1hr of naptime for house stuff – laundry, cleaning, baking, prepping anything for dinner, paying bills, etc. I’d like to be better at this myself too. At times when I have imposed a deadline or scheduled my own tasks successfully, it does feel like life flows more smoothly, and I feel great about my accomplishments. However, it does not come naturally to me yet, and this article is a good reminder that it’s something I want to put into practice. Thanks! I need to get better at this. I am good at planning errand days and my schedule, but I need to get more disciplined at the day to day tasks. I am posting my goals weekly on my blog to hold me accountable! I spent last night rereading your daily schedules from the past. You are so disciplined! * I know every week that my goal is to write 5 articles. As well as makt the pictures for the articles Pinterest friendly. By only writing 5, I have the weekends off, can choose my own schedule throughout the week, and then write more if possible. * I like to do the bulk of my cleaning/laundry/etc in the mornings. I block out around 1 1/2 tolooks nice and I wouldn’t be embarrassed if I had visitors. The bulk of my time is spent on laundry, for our family of seven. * I try to do most of my work before the children get up, naptimes, and at night. It really helps to keep me grounded and focused. I don’t schedule exact times, but I generally schedule a block of time. Down to the minute can be a little overwhelming and stressful, if I’m trying to schedule my whole day that way. Some things it is needed for, but for me, not every day and minute of my life. There is a lot more, but I have to run an errand. So I will stop with these. Hope everyone has a wonderful day. Im so glad to see that so many people like you and some of my friends still use the “old fashion” paper calender. I am like you and love to scratch things off and feel like I really got a lot done. It helps me stay motovated and get more done. I do not think I can ever make the switch to any type of tech calender. I set dead lines for myself also. Its such a bummer when I don’t meet them, but I love your words progress not perfection. I was pretty good the month of April and was able to scratch off most of my goals! Thanks for all your helpful post. I also give myself deadlines, but with as hectic as my schedule is, it’s kind of necessary and easier to stay on point because I know if I don’t do it in that allotted time frame, it won’t get done. I also get with my husband towards the end of each week and find out what things we have to do that weekend and mentally prioritize and figure out what days and time periods I’ll do them in. I actually found that the less busy my schedule is, the less productive I am because there is no time crunch to get things done. Like you, I actually enjoy deadlines and actually function better and am more productive when things are at least a little hectic. This post was just what I needed. I have a couple of home projects in mind that I’d like to tackle but never “get around to”. I think by applying a deadline, it’ll motivate me to get it done – and I’ll be happy that I accomplished something that was necessary anyway. Great job, Andrea!